You are free to reproduce and use the Post Intensive Care Syndrome (PICS-p) Framework for research or clinical practice. The PICS-p Framework may be reproduced on forms with hospital or clinical unit letterhead or logos, or used in electronic record systems. Please cite: Manning, J.C., Pinto, N.P., Rennick, J.E., Colville, G., Curley, M.A.Q. (2018). Conceptualizing Post Intensive Care Syndrome in Children- The PICS-p Framework. Pediatr Crit Care Med, 19(4), 298-300. If you would like to republish the tool in any form external to your organization you will have to obtain permission from the copyright holder - Pediatric Critical Care Medicine. Requests for any changes or alterations in the instrument or requests to translate it into another language should be made in writing to the authors. Post Intensive Care Syndrome in pediatrics (PICS-p) framework. The critically ill child, the focus of our attention, presents to the PICU exhibiting varying levels of health at baseline. The child experiences the PICU within their family unit that includes parents and often siblings. All experience the PICU and require consideration at the family, parent, and sibling level. 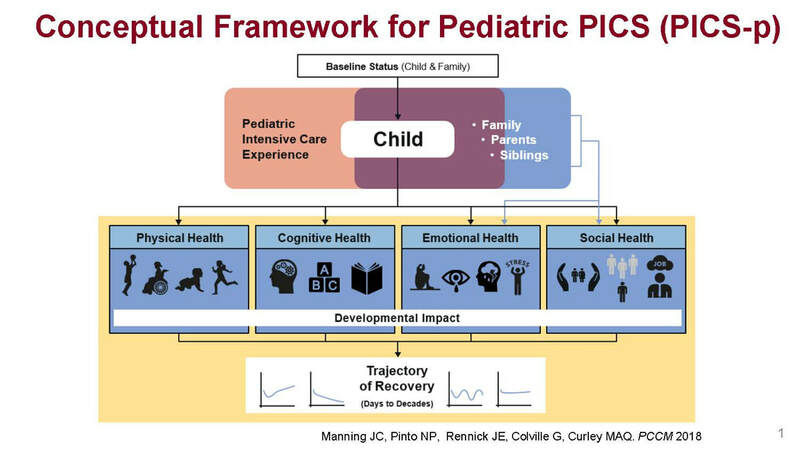 On PICU discharge, the physical, cognitive, emotional and social health of the child varies and is influenced by the child’s pre-PICU state, development, and maturation as well as the natural course of a child’s underlying illness. Family, parent, and siblings’ emotional and social health may also be affected. The trajectory (y-axis) and duration (x-axis) of recovery is variable and may improve, deteriorate, vacillate, or remain static over days or decades. Manning, J.C., Pinto, N.P., Rennick, J.E., Colville, G., Curley, M.A.Q. (2018). Conceptualizing Post Intensive Care Syndrome in Children- The PICS-p Framework. Pediatr Crit Care Med, 19(4), 298-300.